This is a Rev. E0 card so it should be used with a 32 Bit Windows driver - see below for screenshot of the actual card for sale being tested under WinXP 32bit. Operation under 64bit Windows or a later driver version is not supported. This is a PCI card. No XLR cable set is included, but I usually have the BOB1024 breakout boxes listed separately which offer a convenient and robust means of interfacing to the card's inputs and outputs. In summary, AudioScience cards are purpose-designed for multichannel broadcast use. They are supported by most of the main playout and automation software packages straight out of the box and allow each multiple streams each to have its own independent channel with the level controlled either by the software or by the fader on the console. Having four playback channels gives you everything you need for the modern studio - three channels can be used to give you triple overlap voicetracking so that your prerecorded link can be played simultaneously over a segue. The remaining channel(s) can then be used for your PFL/Cue - or maybe for the output of your cart wall application. Up to 8 ASI cards can coexist a single system giving you almost limitless permutations of record and playback channels. Not only can you multiple audio files simultaneously, but you can also simultaneously incoming audio, so your software can do such things as record an upcoming show off a satellite feed, record a phoner segment to hard drive for editing and playback, or for a skimmer recording for DJ coaching. The card will perform decoding of mp3 files using the hardware on the card - reducing the load on the playout machine's CPU. This card will perform timescaling in real time with no shift in pitch allowing your software to ensure that all program segments run to their allotted time - to the second. 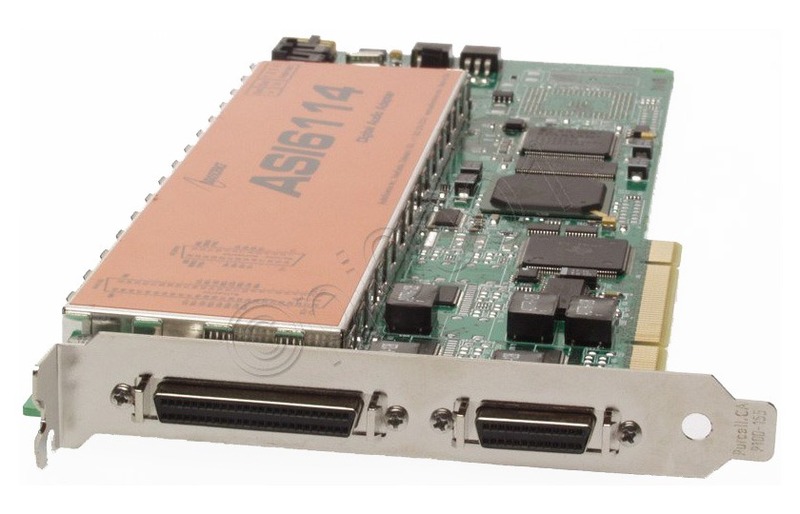 The ASI6114 is aimed at high performance entertainment applications requiring multiple streams of MP3 and MPEG Layer 2 play with both analog and AES/EBU digital interfaces. The ASI6114 uses a 225MHz Texas Instruments TMS320C6713 DSP and provides four stereo outputs, one stereo input, one record stream, four stereo play streams and a powerful multi-rate digital mixer. 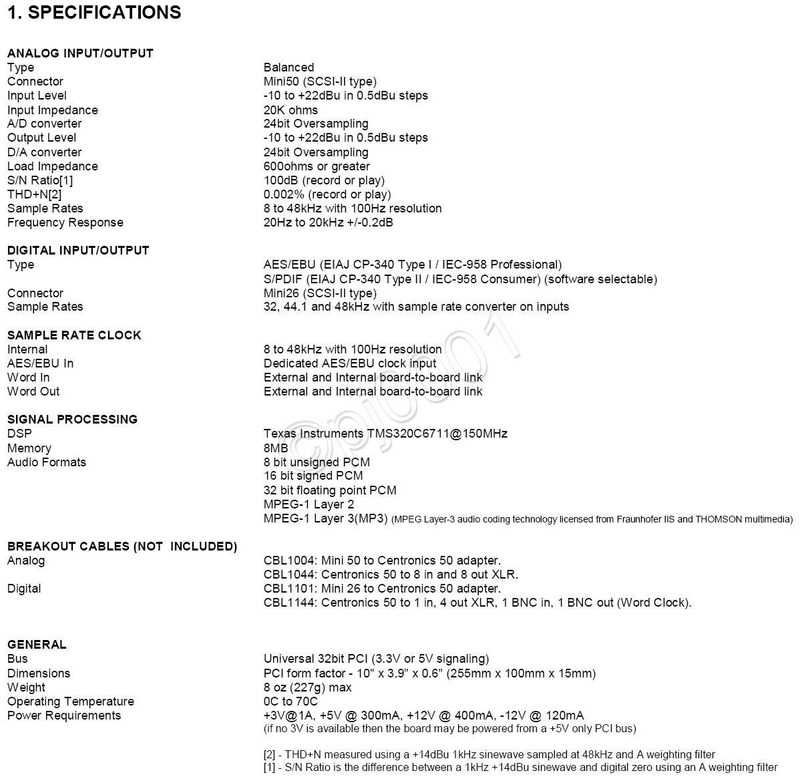 Audio format choices include MP3, MPEG Layer 2 and linear PCM. 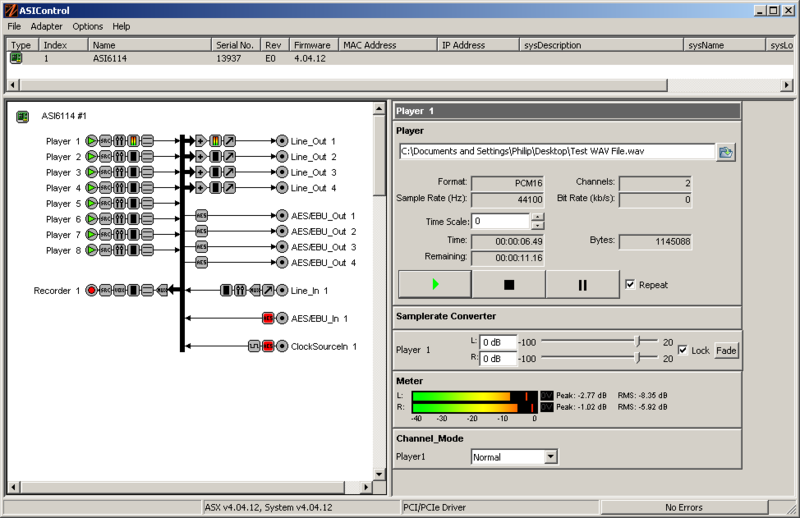 MRX technology supports digital mixing of multiple stream formats and sample rates. TSX timescaling allows compression/expansion of play strams by upto +/-20 with no pitch shift. 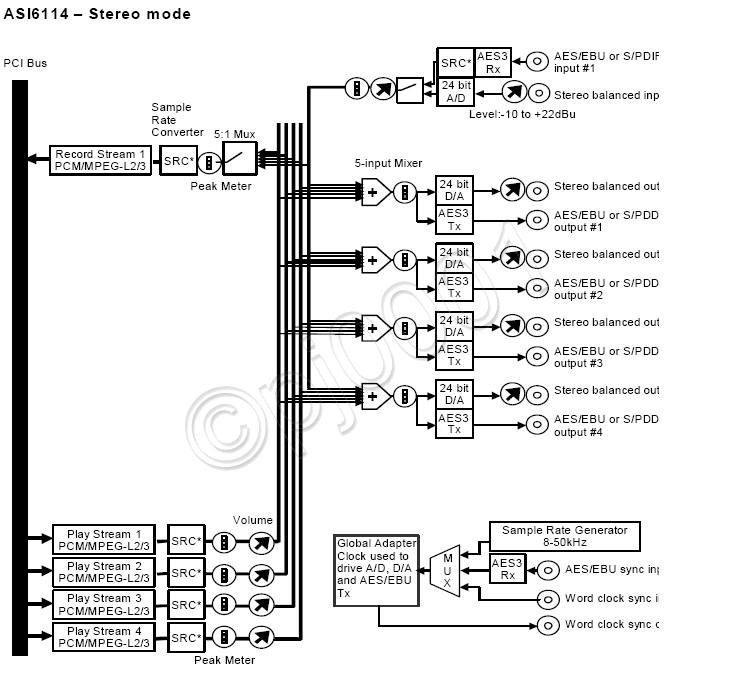 AES/EBU and S/PDIF digital audio input and output (software selectable) with sample rate converters on all inputs. AES/EBU sync input allows adapter clock and AES/EBU outputs to be synched to external AES/EBU reference. High speed 32bit PCI bus interface. 8MBytes DRAM for on-board buffering. Upto 8 cards in one system. Windows and Linux software drivers available. 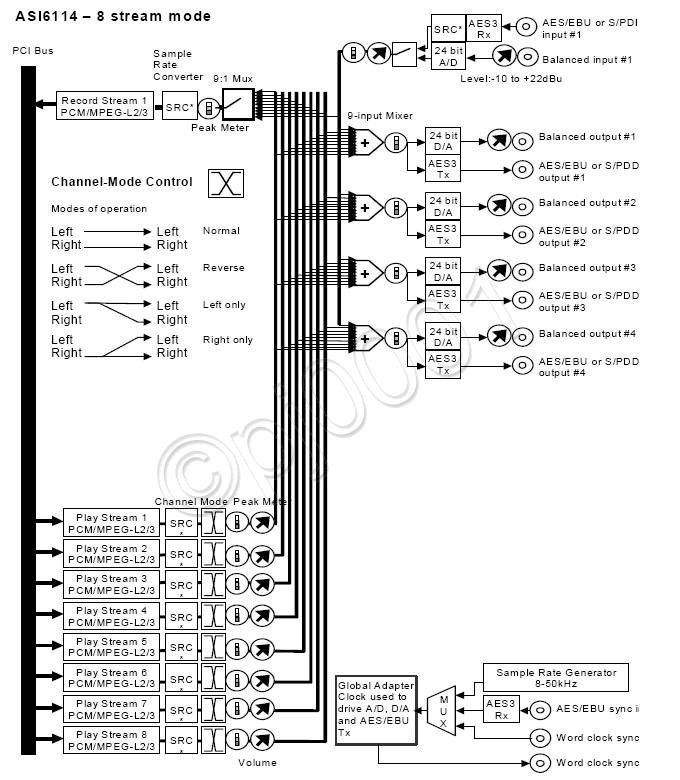 Signal quality is beyond reproach with Pro standard +4dB analog signals being supported with lots of extra headroom. Output can be adjusted down to -10dB consumer levels using the control applet if you want to interface to unbalanced gear.